The Ministry’s and the Municipality’s plan to destroy the memorial is consistent with the genocide denial that is endemic to the political culture of Republika Srpska. In addition, the removal of the memorial is discriminatory, as well as a form of persecution that is a crime against humanity. Such a wanton act of desecration would only serve to confirm that the entity of Republika Srpska has become an apartheid entity. 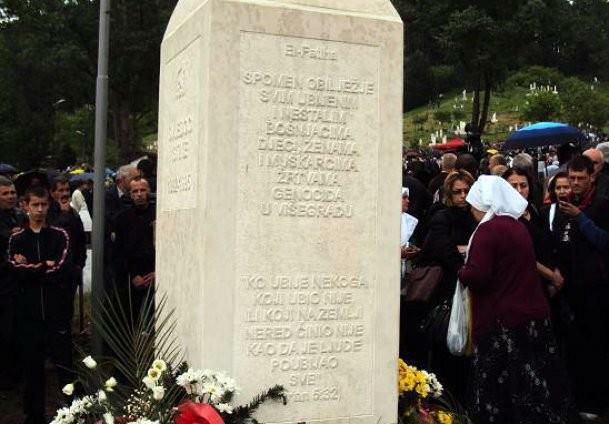 There have been reports that if the word “Genocide” was to be removed from the memorial, the Višegrad authorities would allow it to remain in the cemetery. In fact, such genocide denial is rampant in Republika Srpska from the office of the Presidency to the Municipalities. President Milorad Dodik has repeatedly claimed that he will never accept that genocide took place in Srebrenica. In Prijedor, for example, the Mayor has attempted to prevent commemorations of the concentration camps and of the genocide. 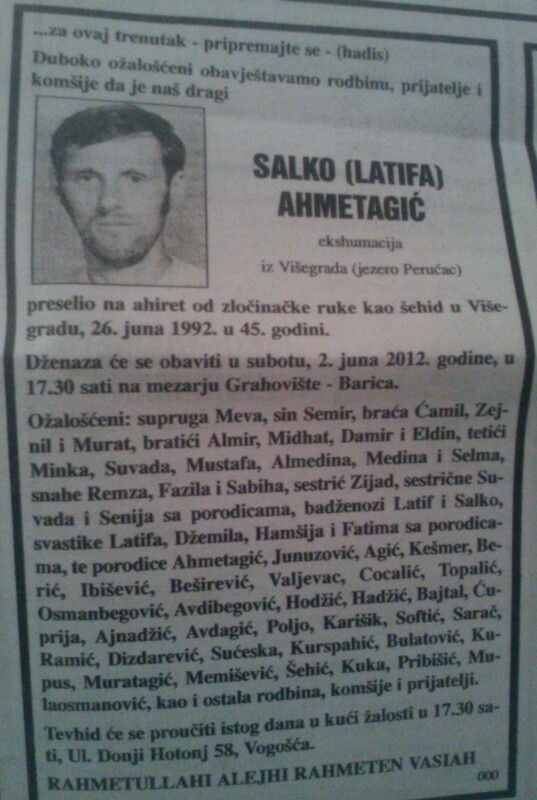 Further, the demolition of the memorial in Stražište is patently discriminatory. The memorial is on land owned by and under the care of the Islamic community. Yet, while the Stražište memorial is to be removed, a prominent memorial to the perpetrators of the genocide has been permanently erected in the middle of Višegrad, and has been the site of ultranationalist rallies celebrating the perpetrators of the genocide. 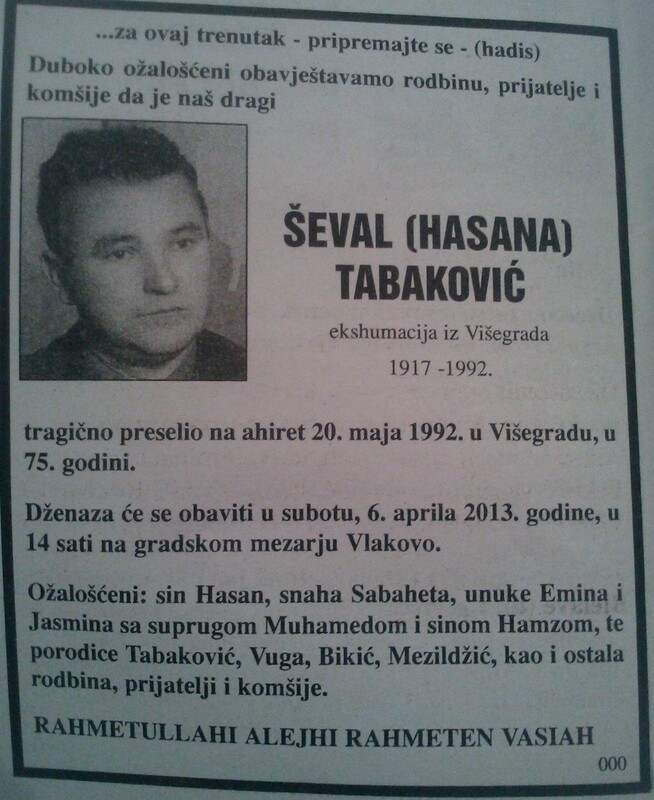 So it seems Bosnian Serbs are permitted to erect statues to the perpetrators, but according to the recent decision, Bosniaks would not be permitted to retain a simple memorial in their own cemetery in a rural location. The threat of the violent destruction of the memorial is clearly directed at those Bosniaks who would think of burying their loved ones in Stražište cemetery, and against all Bosniaks and other non-Serbs who would think of returning to their former homes in Republika Srpska. Indeed, the plan to destroy the memorial seems to be part of a coordinated effort to discourage Bosniaks and other non-Serbs from returning to Republika Srpska. For example, on storefront windows in Višegrad (near the park for Ivo Andrić), one has been able to see large posters celebrating Vojislav Šešelj and proclaiming “Free Šešelj!” In one poster, Šešelj’s face appears alongside “White Eagles,” and on another poster his face is imposed on a representation of “greater Serbia.” Since Šešelj is associated with atrocities that were committed in Višegrad, the public display and celebration of his image is psychologically difficult, if not traumatic, for the survivors who seek to return. 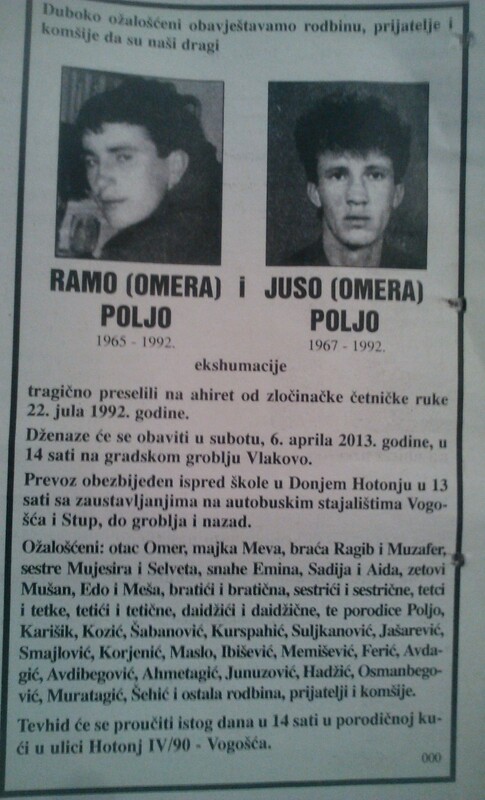 Bosniaks and other non-Serbs would then associate the monuments celebrating the perpetrators of the genocide, and the posters celebrating Šešelj, with the atrocities mentioned above. One is also reminded of the recent campaign slogan of President Dodik’s party (SNSD): “Српска кућа до куће” (“Srpska, kuća do kuće”). The implication is that with a “Serb from house to house” there is no room for the non-Serbs who were forcibly expelled. I would suggest, then, that insofar as the psychological harm resulting from the threat to destroy the memorial and from the iconography of ultra-nationalism and separatism prevents Bosniaks and other non-Serbs from exercising their right to return to their former homes, it would constitute a violation of Annex 7, Article I of the Dayton Peace Accords and of the fundamental human right to move freely within the borders of a state. 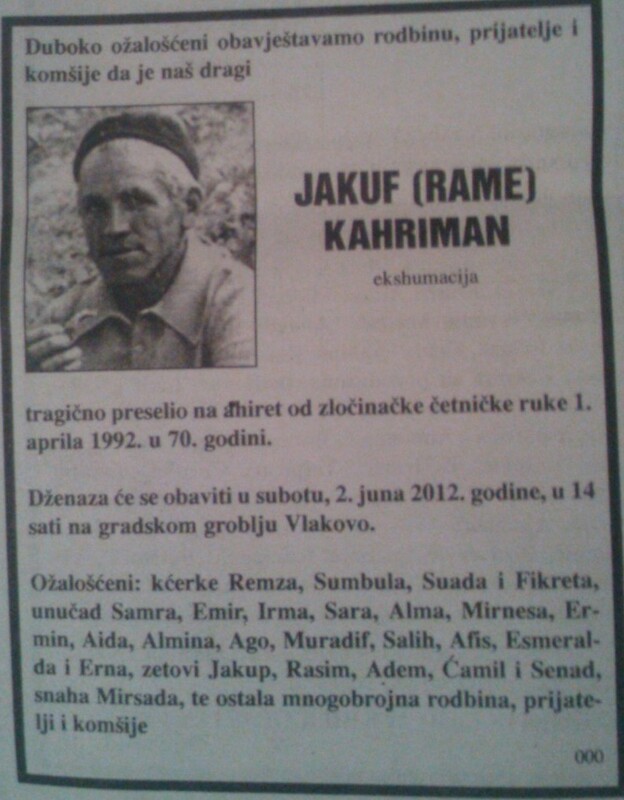 Therefore, insofar as it is the responsibility of the international community to protect Bosniaks from psychological harm and from the deprivation of their fundamental rights, we should recognize the extent to which the plan to remove the memorial in Stražište cemetery can be identified as persecution. Such an act of intimidation and genocide denial should not be allowed in a democratic society with respect for human rights and operating under the rule of law. Specifically, the international community has the responsibility to protect Bosniaks whose loved ones are buried in the Stražište cemetery, as well as those who would seek to return to their former homes in the municipality of Višegrad. In the current case, there is a responsibility to protect the memorial dedicated to the victims of the genocide. To allow the demolition or removal of the memorial would be to endorse genocide denial, discrimination and persecution. We urgently implore you to intervene, under the doctrine of the responsibility to protect, in order to prevent the destruction or removal of the memorial to the victims of the genocide in Višegrad. Initiated the Kadic v. Karadzic lawsuit (New York, 1993-2000), which pioneered the claim for sexual atrocities as acts of genocide under international law.